If you want to be in ‘the now’ with everything going on in the endurance event industry, you need to be using content discovery tools. In case you didn’t know what one is, a content discovery tool is an online platform that directs you to the latest news or articles about what is going on in your space. For example, as an endurance event organiser, you would use a content discovery tool to help you find out information on what’s currently happening in the market. But why would you need to share content like this with your audience? Two main reasons. One, you are providing value to your followers. So long as you know what interests your target audience, you can hand pick content to share with them. All the content you share doesn’t have to come from your brand, engage in the community by using new, relevant content as a focal point for discussion. The second big benefit it brings is brand authority. If you want to be considered a market leader, you had better know what is going on in the market. By engaging in this discussion, you can solidify your spot as an influencer and show your audience that you’re invested in your space. 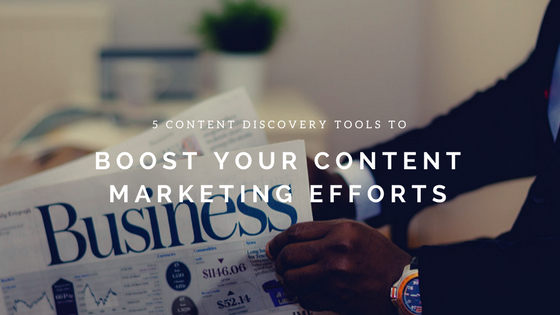 In today’s article, we showcase 5 different content discovery tools that help you to find the most relevant content to your brand, fast. Feedly is one of our favourite content discovery tools, the biggest reason why is just how simple it is to use. Their dashboard is your one stop shop for all the latest content you need. Upon signing up, you select topics that you want to discover content around. As you can see from the screenshot above, we have selected running, triathlon and others. The newest and most shared articles will start to appear on your dashboard. If there is a certain publisher or influencer that you love, you also have the option to add them to your list. Feedly has its own ‘in browser’ reader so you don’t have to visit the site externally, which is a great time saver. You also have the ability to share the content you discover on your social media profiles with just a few clicks. Facebook, Twitter, LinkedIn and Pinterest are all compatible with social sharing. As with most content discovery tools, there is both a free and paid version. The free version will only take you so far but at just $5.40 a month, the pro version is an affordable upgrade for those looking to take their content marketing to the next level. Scoop.it provides users with a robust platform to find relevant and engaging content for social media and other platforms without the hassle of extensive searching. They have also taken their platform one step further recently and now offer functionality to automate your content marketing efforts on their site. You can create your own content calendar so you never miss a beat in your content marketing efforts. Much like Feedly, you select the topics that you want to discover and they are curated into ‘boards’ for you to browse. We’d recommend setting up different boards for different topics so your feed doesn’t become too cluttered. What we really love Scoop.it is that they actually recommend what keywords/content you should use based on the performance of your old shares. This is an amazing tool that helps you to better understand your target audience and allows you to keep them constantly engaged. Additional features (everything from scoop scheduling to team curation to newsletter publishing) are available through paid upgrades. EpicBeat is a great platform that not only tells you what people are talking about but also how they’re talking about it. From your search, you’ll be able to see how many people are talking about your topic, where they’re talking about it, and even who’s talking about it. You’ll get powerful insights on which days the content is popular, how much overall success, and much more. You’ll even be able to see which individuals are most influential on the topic and get a breakdown of how and where they share. One of our favourite features is the EpicBeat display a lot of their data in graphical form. If you’re analytics junkies like us, EpicBeat is for you. The one downside is that although there is a free trial, there is no permanent free option. If you want to check out the features list for their paid service, visit their product pages. Right Relevance is a lesser-known content discovery tool compared to some of its competitors but still, has some amazing features. Their product is focused on three different focal points: articles, influencers and conversations. The article section works like many of the other content discovery tools, you set your keywords and you’re given a variety of relevant content that is easy to share across your social accounts. What really sets Right Relevance apart is that after you select your keyword, you can browse the top conversions that are happening real-time on that topic. It’s fantastic for finding regular content streams in which your brand can engage in. Best of all, Right Relevance is free. You can pay extra to have their platform integrate with your API but that service is still in development so jump on whilst you can! Boasting over 3 million users, Buffer is the big player in the content discovery market. Like its competitors, with Buffer, you have the ability to discover content, schedule your posts across multiple accounts from the easy to use dashboard. One of the most appealing features of Buffer is just how easy it is to get to grips with. On top of this, you also have the ability to connect with many third-party apps that allow you to take your functionality to a whole new level. Buffer is primarily a social media management tool with the content side only being recently added. If you’re looking for a robust content discovery tool, the other options on this list are probably more valuable. But the social side of Buffer certainly warrants an extra look if you want to integrate content discovery with your own social schedule. You can get a free account of Buffer with limited functionality but can upgrade from $10 a month to access more features. Hopefully, you find this list useful and it helps you to grow your content marketing strategy. In our opinion, don’t just stick to one, use them all. They all use different algorithms to find content so what you may discover on one platform, you won’t on the other. What we suggest is to sign up to each site, bookmark them under the same tab and use each one daily. You’ll be surprised how quickly you can start to grow and engage your audience with these content discovery tools! Don’t forget to subscribe to be kept up to date with the latest event management news!